1. Markets surge: The Dow Jones industrial average surged 1% and closed at a record high on Thursday. It's the index's first new record since January. The milestone shows that Wall Street is mostly unfazed by the escalating trade clash between the United States and China, the world's two biggest economies. The Dow closed at 26,657. It has spiked about 3,300 points since hitting a recent low on April 2. Investors are betting that the strong US economy will help minimize the impact of tariffs. The S&P 500 gained 0.8% on Thursday and the Nasdaq added 1%. Momentum could continue on Friday. 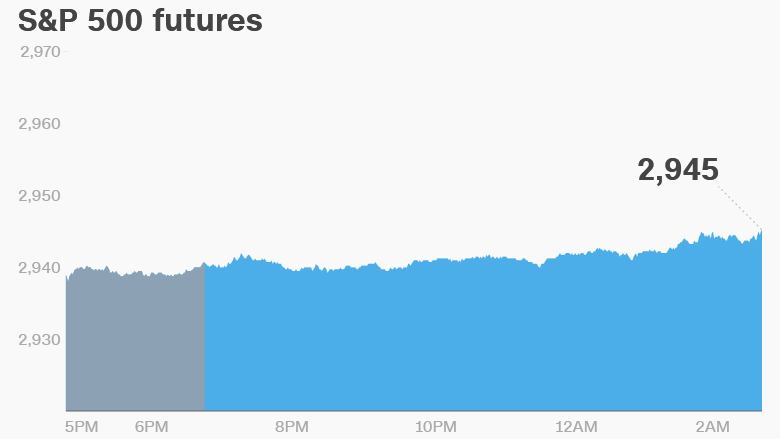 US stock futures were higher, and European markets opened with gains. The Shanghai Composite jumped 2.5% and Hong Kong's Hang Seng increased 1.7%. 2. Sky drama: The fate of European broadcaster Sky is likely to be decided on Saturday. Sky (SKYS) has been the subject of an extended fight between Comcast (CCZ) and 21st Century Fox (FOX). Fox is now backed by Disney (DIS), which is in the process of buying most of Fox's entertainment assets. The UK Takeover Panel is set to hold an auction for Sky on Saturday if there's no resolution to the long-running takeover battle by close of business on Friday. 3. New Apple products: Apple's new iPhone models are hitting stores. The smartphone has been Apple's (AAPL) biggest cash cow for years and investors are watching its sales closely. The 5.8-inch iPhone XS starts at $999 in the United States, while the iPhone XS Max costs $100 more. The "affordable" iPhone XR ($749) ships next month. The company is also releasing iOS 12, Apple Watch and software updates to its HomePod and tvOS devices. 4. Companies and economics: Uber is in talks to buy UK-based food delivery company Deliveroo, according to Bloomberg and the Financial Times. Both companies declined to comment. A deal could spark a wave of consolidation in the crowded food delivery industry in Europe. Shares in JustEat (JSTTY), another UK-based player, tanked 6.7% on the reports. Shares in India's Yes Bank plunged 34% after the Reserve Bank of India said the bank's chief executive has to step down by the end of January 2019. Jet Airways stock dropped as much as 7% after a rough couple of days for the struggling Indian airline. It was questioned by India's tax authorities on Wednesday, and around 30 passengers complained of nose and ear bleeds due to low pressure on a flight Thursday. Canadian inflation data will be published at 8:30 a.m. ET. Shares in GE (GE) dropped 3% on Thursday after the company said one of its gas turbines recently suffered a glitch at a Texas power plant.